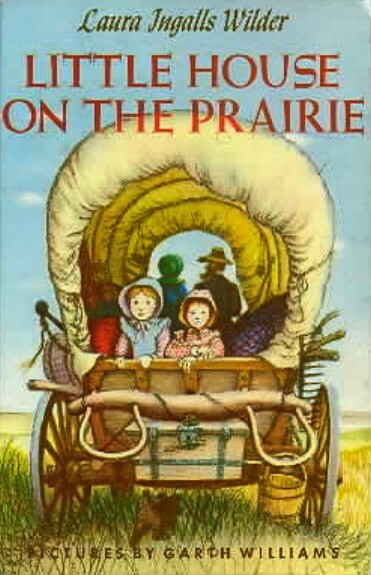 The second book in the Little House Read-Along was Little House on the Prairie. While I was soaking in the pure joy of life in Little House in the Big Woods, Pa decided there were too many people settling his area of the woods. He uprooted his family to travel west, beyond the Mississippi River, into Indian Territory, in Kansas. If Big Woods is pure joy, this book is like pure anxiety. After Laura assigned a gentle personality to her sweet home in the woods, they quickly said goodbye to their grandparents, uncles, aunts, cousins, and cat. Goodbyes are never easy. Soon they crossed the frozen Mississippi, which coincidentally began to thaw and crack hours after they safely made it to the other side. Crossing a ford was even more dangerous. Pa almost lost control of the horses and covered wagon, but Jack, their beloved and important bulldog - or guard dog - vanished. How heartbreaking this was for Laura! Gratefully, they were reunited with Jack later that evening because he found his way back to his family, and Pa admitted that he should have allowed Jack to ride in the wagon while crossing a raging ford. You think? Not long after that adventure, Pa found the place where they would make their home, near the Verdigris River. Meanwhile, Ma still expected her girls to have manners, even if they were "miles from anywhere." And Charles added that they were 40 miles from Independence, as if that helped. Next began the construction of their log home. Before they learned that they had a neighbor to help build the house, Ma had to lift heavy logs with Pa. Unfortunately, one fell on her ankle, spraining it. Once the cabin was complete, they had to expect Indians, who, on numerous occasions, entered their home uninvited, and took food, tobacco, and Pa's furs that he trapped (though thankfully they decided to drop the furs at the last moment). Poor Ma. They had to deal with wild animals, too. Pa told about a pack of wolves that followed him and his horse one day; and later that night, the same pack surrounded the house. Of course, Laura always knew she was safe, as long as Pa and his gun, and Jack, were nearby. One night they thought their neighbor's wife was screaming, and Pa went to investigate. In the morning they learned it was a panther. Phones would have been useful here. Another time the chimney caught fire - while Pa was out, of course - and Ma had to beat it out with a stick, which is beyond my comprehension of how that was successful. Ma adopted Pa's grateful attitude of, "All's well that ends well." Frankly, I did not think a chimney made of wood sticks was a good idea, but what do I know. Speaking of fires, one afternoon a mysterious, quick-moving fire was headed their way across the prairie. There was only so much time to build a defense around their little log cabin to protect it and their animals. Talk about having a heart failure. To add to the merriment of this new life on the prairie, the entire Ingalls family was debilitated by a terrible illness so that they were incapacitated at the same time. There were no family members to care for them; but a neighbor and an Indian doctor generously came to their aid, thanks to Jack who alerted them. The most agitated situation, however, was the Indian war council, which went on nightly for a long period. Laura remembered the dreadful beating of drums and the yelping and shrieking of Indian voices. Pa was always awake and with his gun, and never worked in his field. No one went out of the house, and rarely did they fall asleep. However, one day it ended, and they learned that the local tribes had a council to discuss assaulting the white settlers; but thankfully they were convinced not to, and instead the Indian tribes dispersed. Whew. That prairie looked as if no human eye had ever seen it before. Only the tall wild grass covered the endless empty land and a great empty sky arched over it. Far away the sun's edge touched the rim of the earth. The sun was enormous and it was throbbing and pulsing with light. All around the sky's edge ran a pale pink glow, and above the pink was yellow, and above that blue. Above the blue the sky was no color at all. Purple shadows were gathering over the land, and the wind was mourning. All along the road the wild larkspur was blossoming pink and blue and white, birds balanced on yellow plumes of goldenrod, and butterflies were fluttering. Starry daisies lighted the shadows under trees, squirrels chattered on branches overhead, white-tailed rabbits hopped along the road, and snakes wriggled quickly across it when they heard the wagon coming. My favorite chapter was about the Texas longhorns (cattle that crossed the prairie, with cowboys leading them). Laura said she could hear the cowboys' lonely songs "wandering in the night." She recalled that "they made her throat ache." Once Pa had to go to Independence to trade his furs, which was an anxious time for the family to be alone for several days and nights; but they had Pa's gun, and Jack. Also a neighbor came by every day to do Pa's chores and check on their well-being. Nonetheless, they all watched earnestly for Pa's return, especially because this was about the time that the Indian war councils began. When Pa finally arrived, he had an armload of goods from the store, and special gifts for Laura and Mary. It reminds me of when my husband goes away on business trips for a week, and our kids get excited about him coming home, as the day approaches. When he finally arrives, he empties his bag full of gifts, specifically for them, just like Pa did for his girls. Now let us talk about the Indians again, as this is a major theme of this book. Pa was always respectful of them, and believed they could get along as neighbors. "He figured that Indians would be as peaceable as anybody else if they were let alone." However, he also understood their future, which was to continue being pushed west by the U.S. government and settlers. In response to the Indian war council, he thought, "...an Indian ought to have sense enough to know when he was licked." In other words, there was no hope for Indians to defeat the U.S. government regarding land and settlers. Either they assimilate into the white settlements, or keep moving west with their tribes. Indians fascinated Laura. After the war council broke up, the last tribe left along the trail that passed by the log cabin. The Ingalls family watched them go by all day long, in a solemn procession, and Laura had a "naughty wish to be an Indian girl." After the last of the Indians had left, it seemed that life on the prairie would finally now prove to be a good decision. A year had passed, and they had survived everything they faced. The little house was becoming a home, and the crops were starting to grow. But what happened? Pa learned that the U.S. government was sending soldiers to remove settlers from Indian Territory. Pa refused to be forced off the land, "like an outlaw," and he packed up the family to leave immediately. And they did. Ma sighed gently and said, "A whole year gone, Charles." But Pa answered, cheerfully (of course): "What's a year amount to? We have all the time there is." P.S. All pics are of my family's visit to Little House on the Prairie museum in Independence, Kansas. Wow, the photos are so effective. Can you just imagine living there in a cold winter with snow and freezing temperatures? Brrr ....... People must have been so hardy during those times. I remember reading in a non-fiction book that Ma finally made Pa promise at some point that they wouldn't leave the town of DeSmet (I think it was). Now I understand why! Absolutely! She said put her foot down in DeSmet. Pa still played with the idea of going west, but she was done, and I don't blame her - especially after this excursion. Interestingly, Laura did not mention much about crazy weather in Kansas, except the wind, which was a burden on the prairie. But I am sure temps dropped significantly in winter. MY GOODNESS, I wish I had time to take part in this event! You are making me nostalgic, & this is the book I dislike in the series. (I love all the others.) :) If I reread it one of these days, I might find I like it though. I haven't read it since 2010. Hi, Jillian! There is plenty to appreciate in LHOTP, but I never understood why they left family to live in the middle of nowhere. It is such a contrast with the life they lived in Wisconsin. Yes, that is one of the reasons he preferred moving further west b/c the soil was better and no trees to cut down or stumps to work around. However, I still don't understand why he would move his family so far from their loving relatives; yet, I think it was also Pa's spirit, as it was Laura's, to just keep going west. Absolutely loved the pictures! I pictured the china shepherdess much differently, however. Those houses really are little, aren't they? Me, too. I wonder if that shepherdess was exactly like the real one or just something different??? And, yes, I couldn't believe how small the house was and how they fit everything in it, that Laura described. Glad to see you were also appalled at Pa for not putting Jack in the wagon! :) Your "phones would have been useful here" comment made me laugh out loud! I love the descriptive quotes you included and the policies/thoughts about the Indians! So glad you joined us for this reading event! Great review...and, of course, the pictures made it!! Thank you for sharing them. It really helps envision what it was like, doesn't it? That's why I am grateful to read these stories b/c it is a vivid picture of pioneer life. I definitely couldn't make out there. I loved that pure joy and anxiety comparison! It's so true! That Little House on the Prairie museum looks so cool! The Indian war cry section is very effective. It gives me the chills.